Vegas Strip Blackjack is a quite interesting blackjack variation for those players who look for something new and exciting to play. The interesting fact is that this game can be found and played only in Las Vegas (if you want to play it in a land-based casino of course) or using online casino: the game was named after the world-famous boulevard in Vegas where all popular casinos are located. 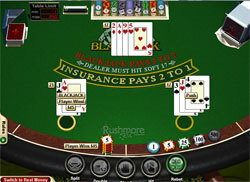 To play Vegas Strip is not difficult at all for those gamblers who know how to play blackjack, but certainly they should know some secrets of this particular variation: the strategy for Vegas Strip has been developed which gave players hints and tips concerning what options to choose and what steps to do while playing this blackjack game. 1. Always split Aces because it is impossible to bust when you have an Ace; moreover, Aces can be counted both as 1 and 11, so, you will have an advantage anyway. 2. If you have a hand of two 10's, it is not recommended to split them because you will increase a house advantage in such a way: two 10's give you a good hand anyway, and chances to win it are quite big. 3. Insurance is possible in Vegas Strip but it is not recommended to make such an option: in this case a house edge increases up to 7%, so, it would be not wise to give them such a chance to earn money. 4. Sometimes, it can be difficult to decide what step to do when you have a hand of two 5's; Vegas Strip strategy recommends you to double down these 5's. But! Do not double down them if a dealer's open card is 10's or an Ace: in this case you are strongly recommended to hit. 5. If you plan to use Vegas Strip strategy, the best advice here would be the following: learn the rules perfectly, understand and follow Vegas Strip strategy chart; it is the same both for Multi-Hand blackjack and Single-Hand blackjack. Remember, however, that playing Multi-Hand Vegas Strip is not the same with playing 5 hands at once because the maximum hands you can play here is 4.